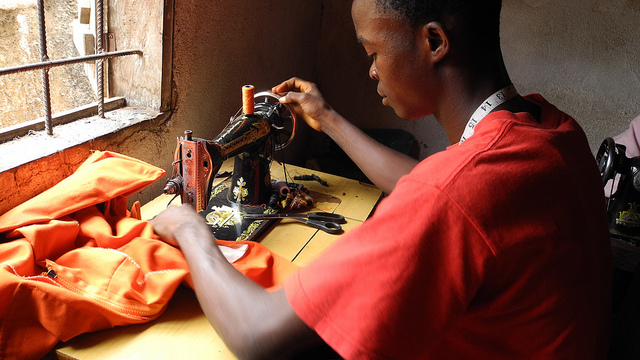 An International Labour Organization survey on transition to the labor market showed that although more than half of youth work, the quality of their employment is often poor, making it difficult for them to make the most of their economic potential. The Brookings Institution’s Foresight for Africa report shows that only 28 percent of workers have stable, wage-paying jobs. The skills mismatch is the result of poor quality education and a failure to link education curriculums with the needs of the market. Although net enrollment rates in primary education have improved tremendously in most African countries thanks to the Education for All movement and Millennium Development Goals, the needle has not moved much in access to secondary and tertiary schools or vocational training. Four in every five children of primary school age were in school in 2012, but in lower and upper secondary schools, gross enrollment rates were just 50 percent and 32 percent, respectively. In total, 121 million young people—12 percent of the population—were not in school in 2012. Evidence shows that differences in learning outcomes—not schooling levels—explain variations in economic growth across countries. In fact, the high-level learning (measured by math and science assessments) achieved in East Asia during its demographic bonus years helps explain the difference in economic growth from 1960 to 2000 compared to Latin America, which had similar levels of school completion but lower levels of learning.